Trex is the #1 composite deck board in the nation. Not only is Trex decking the #1 composite decking board in the nation, but is also our top pick. We have been installing Trex composite decking for over 20 years. We have found that not only is the quality unmatched by other manufacturers but that Trex Co. is always there to stand behind their product. A Trex® composite deck is ready whenever you want to use it. No sanding, staining, or painting here. A little soap and water or a quick power washing is all the maintenance Trex requires. Wood decks take constant care. Trex composite decking is more durable and longer lasting. Trex is the first composite company on the market that carries the International Code Council Evaluation Service (ICC-ES) SAVE verification for recycled content. Its unique blend of wood particles and recycled plastic gives it the strength that you love while keeping the environment safe. Trex is made up of 95% recycled material, more than any other product on the market. Even in the production process Trex doesn’t hurt the environment. You can feel comfortable with your beautiful Trex Deck knowing that you aren’t hurting the environment. We’ll never charge you for a deck quote. We’re happy to meet with you and explore all your decking options and help you design a deck that fits your needs. 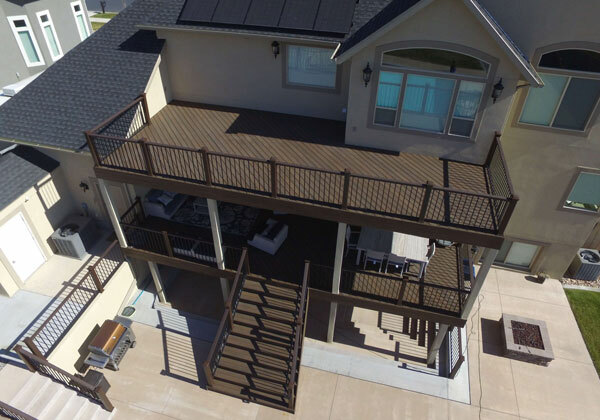 We have been installing decks in Utah since 1989, we know a thing or two about building a quality deck. We are the deck contractor in Utah that you can trust. CFC is the longest standing TrexPro® Platinum deck contractor in Utah. TrexPro® Platinum is the highest level of recognition available for an independent contractor. TrexPro® Platinum deck builders are the leading TrexPros in their markets, with demonstrated ability and expertise to design and build outdoor living projects with Trex, ranging from the simple to the most complex. If you have any product warranty claims in the first three years, labor is also covered.